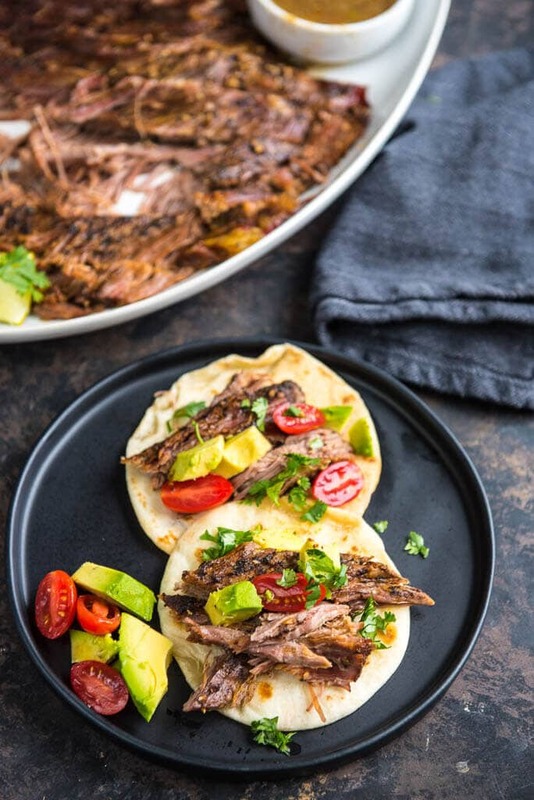 Slow Cooker Carne Asada is a simple way to make delicious tacos any night of the week! 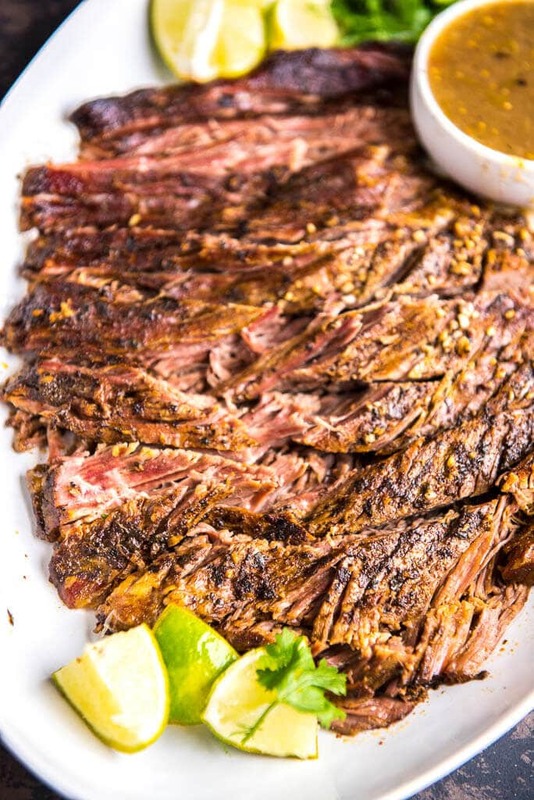 This tender delicious beef has just the right seasonings! If you read this blog on any semi-regular basis, you’ve probably already guessed I have sort of what you might call a taco obsession. And if you’re one of the people who eats in my house on a regular basis, then you know it for sure. (Wait…. is anyone in my family actually reading this?). For one thing, tacos can be super easy and quick. When in a pinch, I can brown up some ground beef (or pull some already cooked ground beef out of the freezer if I’ve been good at planning) and add some of my favorite homemade taco seasoning. When I have a little more time, well, I still want something easy, but I do like to get just a little fancy as well. 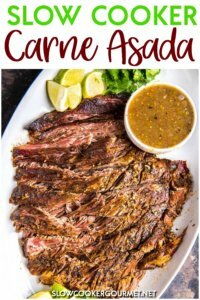 This Slow Cooker Carne Asada is the perfect solution and no need to worry about grilling! In all honesty, this slow cooker carne asada for tacos is almost easier than the less exciting ground beef version. 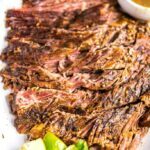 Just toss a simple flank steak and my homemade steak marinade in the slow cooker all day and it’s so tender when you get home that it practically shreds itself. Add to some tortillas with your favorite toppings and you can have a great Taco Tuesday without all the fuss! I like this method so much better than making my carne asada grilled because it allows you to make it even when you are busy. That makes it great for parties or entertaining because you can easily add it to the slow cooker even if you won’t be home all day and have a delicious dinner to serve to your guest without stress or time worries! Of course, you can do grilled steak but I made this in my casserole slow cooker because it made it even easier! The beef fits perfectly and will be easily covered with the juice. Not to worry if you don’t have one though, just cut the beef to fit a regular slow cooker so that it is all covered with the sauce and will cook up tender. This helps it to stay so much more juicy and tender than when you make it on the grill. 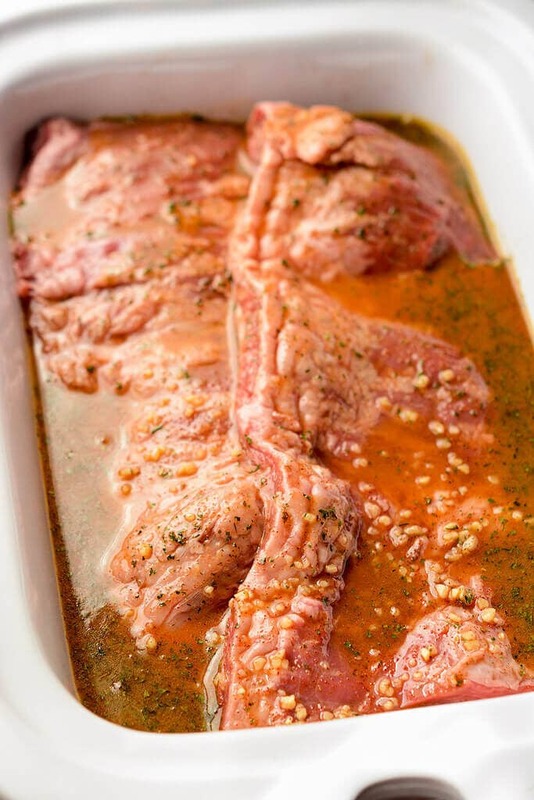 The marinade here is simple, but just right for this cut of meat. 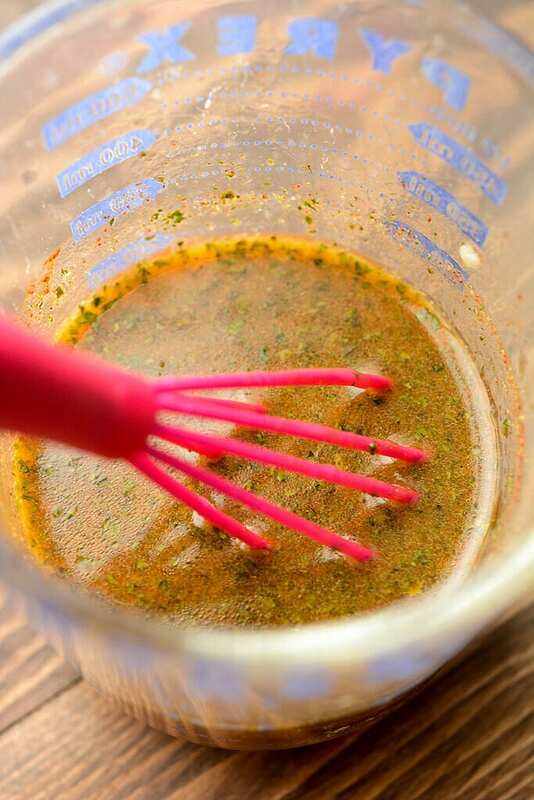 The acid in the juices helps to tenderize as it cooks and the spices give it just the right amount of flavor. Offer up a few simple topping like some corn salsa or some guacamole and let everyone dish up their own favorites. Simple is best and a nice mild cheese goes well with this although I must say they don’t even really need the extra flavor! Even just some simple sliced avocado and a grilled tortilla will make an amazing meal. If serving to a crowd add a slow cooker of chicken tacos and let everyone dish up their own plates buffet style. on fries – probably my favorite option! pretty much anything else you could imagine! 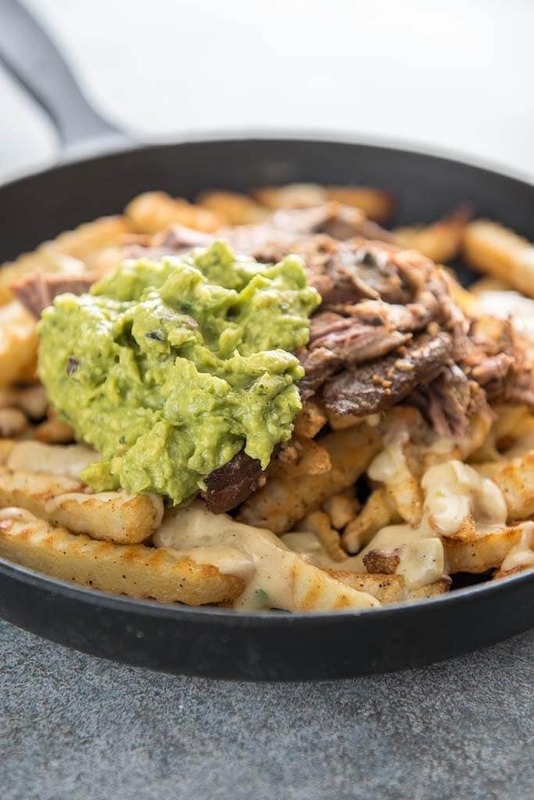 For a fun and creative meal or the perfect appetizer to serve at your next gathering check out my carne asada fries recipe!! Crispy fries topped with homemade queso blanco and easy guacamole = heaven!! If you like pepper you can add a little to the marinade as well, either some ground bell pepper or black pepper seasoning. If you doubled all of the cooking juice ingredients it should turn out just fine!! Follow up on not seeing the video. In Safari no video, but I switched to Firefox and video is there. I guess it is an issue with the Browser used. By the way this recipe sounds delish and I will be trying it. Glad you found it Judy!! Thanks for letting me know and I will check into that issue with Safari!! I would very much like to watch the video but can’t find a link for it here. Is there another post which includes the video? I came here from the newsletter link. I want to convert this to a pressure cooker recipe….but I’m nervous. Do you think this would alter the tenderness? I think it would work great. I don’t have specific conversion as I haven’t tested this one, but I’ve made other cuts of beef like brisket in the pressure cooker with great results. Will this work without the honey? Or what can I use in place of it? The honey smoothes out the flavors a bit, so they may be a little more harsh? without but you could try ommitting or subbing with brown sugar or maple syrup. I can’t wait to try this recipe! Thanks for sharing in! One question: I don’t see any salt listed. No salt? Do you think this would work with actual carne asada? Our grocery store sells uncooked sliced carne asada and it is quite a bit less expensive than flank steak. Hi Elizabeth! Carne Asada actually refers to the preparation of the meat (literally meaning grilled meat) so I’m not sure on the cut you are talking about. I would check with the butcher and let them know what you are making and ask if this will work. It’s also flank steak. 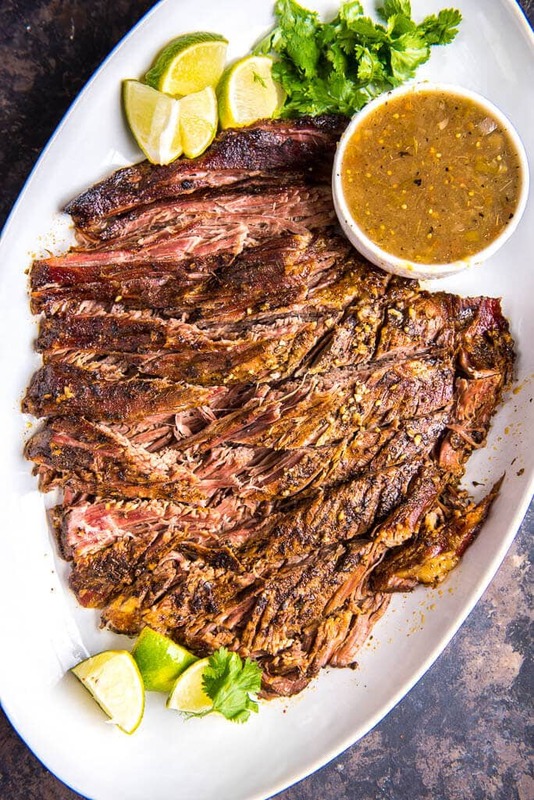 Our grocery store sells it as Carne Asada meat as well, it’s just flank steak slicked SUPER thin (sliced horizontally so think uber thin flank steak. It’s exactly what I”m going to make it with this weekend, I plan on splitting the meat between actual Tacos for dinners and ‘burrito bowls’ for lunches. Looking forward to it!! If it pans out the way i expect it to next week I’ll be freezing several batches of this in the marinade to cut down on meal prep later.